How do we build economically and socially vibrant communities we where we will want to live and work? How can we plan for development that addresses the critical need to conserve water, save energy, and reduce the fossil fuel emissions that are contributing to climate change? How can I make a difference today and into the future? These are the questions that 135 high school students participating in Rockland P.L.U.S. 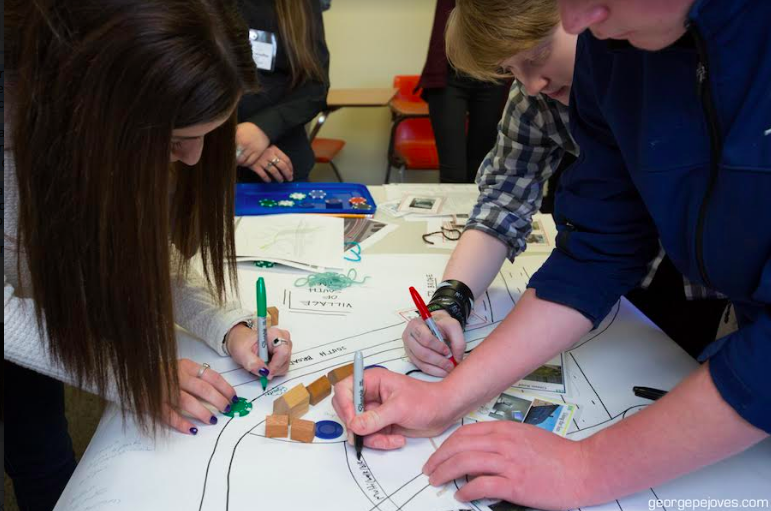 (Planning Land Use with Students) will address when they gather for the program’s culminating symposium at St. Thomas Aquinas College this Friday, March 23, 8:30 a.m. – 1:30 p.m. Students from seven participating high schools – Albertus Magnus, Clarkstown North, Hudson Valley P-TECH, North Rockland, Nyack, Spring Valley, Suffern – will present their visions for the redevelopment of 13 different local sites now under consideration for redevelopment. Their redevelopment plans were mapped out during several classroom workshops. In these workshops, students explored the perspectives and needs of community members at different ages and stages of life. They weighed and considered a variety of specific smart building and green infrastructure design features, while looking for ways to promote a balance of Social Connections, Economic Opportunity & Environmental Sensitivity (S.E.E.) – to see their community in a whole new way. On March 23, participating students will gather further input from 35 local professionals who are volunteering as mentors for the project. Following their poster presentations, the students will work collaboratively in mixed school teams to apply what they’ve learned to a new redevelopment site – portions of the new NY Center for Innovation on the former Pfizer campus in Pearl River. Rockland P.L.U.S. is a partnership of Keep Rockland Beautiful, Columbia University LamontDoherty Earth Observatory, Rockland Conservation & Service Corps, Rockland Economic Development Corporation, and St. Thomas Aquinas College. This program is made possible with funding from lead sponsor, SUEZ Foundation, as well as generous support from Old York Foundation, Peoples United Community Foundation, Orange & Rockland, Rockland Municipal Planning Federation, M & T Charitable Foundation, and Rockland County. To learn more visit www.ldeo.columbia.edu/edu/plus/Rockland.html. If you have any questions email Sonia@KeepRocklandBeautiful.org.